This entry was posted on November 19, 2015 by Y Hasegawa. Looking for an "Outstanding Futon Shopping Experience?" As I've written before, it is extremely important for me to create a shopping experience on our website (and when responding to questions before our customers buy) that lives up to the quality of the futon we sell on FutonBedsFromJapan.com. I live to get more of these great testimonials! You might think that after receiving so many of these "glowing" testimonials that I might grow accustom to getting them and maybe not get so excited when they show up. Nothing could be further from the truth!! I absolutely love them. I get excited every time. Doing a work and selling a product that leaves people so impressed when it shows up at their door is really something I actually live for. (Yeah, I know . . . I must not "get out much" . . . But it's true.) It is very rewarding to create an "outstanding futon shopping experience." 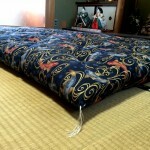 "My shopping experience with Futon Beds From Japan was outstanding. The webiste [sic] had so much information, I could order with confidence. Dean communicated with me along the process from ordering to delivery and post delivery follow-up. I received my futon in under a week - it is beautiful and so well made. Thanks!